John McLaughlin's comments have caused controversy. 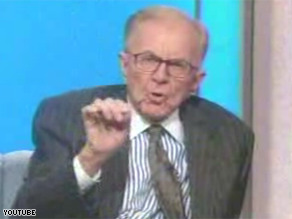 (CNN) - Longtime Washington talk-show host John McLaughlin is facing fire Monday for referring to Barack Obama as an "Oreo" during a segment on his Sunday political program, "The McLaughlin Group. The veteran Washington journalist was discussing the recent comments from the Rev. Jesse Jackson, who was caught last week by an open microphone on Fox News saying the Illinois senator is "talking down to black people" as he campaigns for the White House. Those remarks were largely seen in reference to Obama's recent admonishment at a Chicago church of some black men who he said were not living up to their responsibilities as parents. Referencing Jackson's comments, McLaughlin said Obama "fits the stereotype blacks once labeled as an Oreo - a black on the outside, a white on the inside." "Does it frost Jackson, Jesse Jackson, that…an Oreo should be the beneficiary of the long civil rights struggle which Jesse Jackson spent his lifetime fighting for?" McLaughlin asked his panelists. The term "Oreo" is often viewed as a derogatory term toward some African-Americans who appear not to exhibit certain stereotypes of their race. Panelist Peter Beinart, a senior fellow on the Council of Foreign Relations, immediately called that depiction of Obama "completely unfair." Michelle Bernard, another panelist on the program and the president of the Independent Women's Forum also said she disagreed with the comments, saying "If Barack Obama is an Oreo, then every member of this generation of African-Americans is an Oreo, because we stand on the shoulders of the people who fought for our rights, and all of us say that you cannot blame 'the man' or white racism for everything that ails the black community." Roland Martin, a CNN contributor and host of a syndicated radio show, says some people may be overreacting to McLaughlin's remark. "Obama's candidacy is bringing to light to the internal conversation that is taking place in black America and white America. I think a lot of people are uncomfortable with the dialogue," he said. "If John McLaughlin was an African American and who had made the comment, people would have said, well, he probably understands what he's talking about." "The reality is we also have a white, his mother is white and his dad is from Kenya," Martin also said. "I think that is the qualifier there and this is a debate that you have heard take place inside of the black community that you also have people who question someone like Obama, where does he stand? Is he black enough?" This is a major DISTRACTION away from the ISSUES! This is why many youth are attracted to Obama! We're tired of so called "adults" being so ignorant. Let a black person call a white person a cracker on air and it'd be the end of the world!! John is a senile old man and should get in a time machine and get back to the 60's! The Right wing party is one of Hatred!" But it's ok to call Bush and Chaney Nazi's correct? At least Obama IS an Oreo.